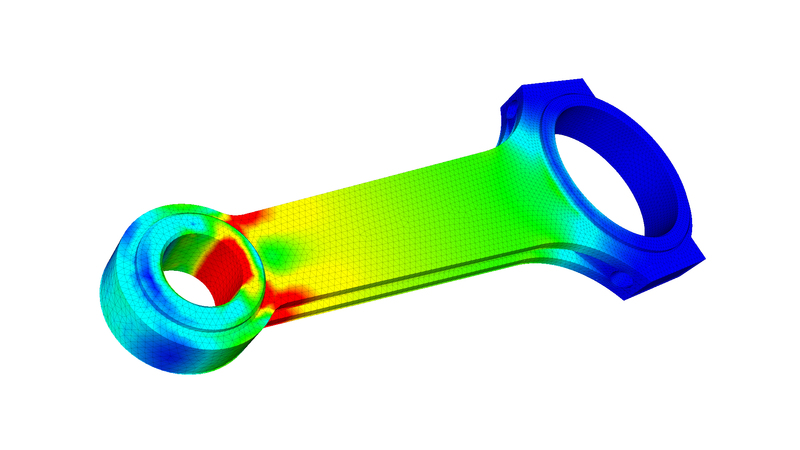 What is FEA | Finite Element Analysis? The Finite Element Analysis (FEA) is the simulation of any given physical phenomenon using the numerical technique called Finite Element Method (FEM). Engineers use it to reduce the number of physical prototypes and experiments and optimize components in their design phase to develop better products, faster. It is necessary to use mathematics to comprehensively understand and quantify any physical phenomena such as structural or fluid behavior, thermal transport, wave propagation, the growth of biological cells, etc. Most of these processes are described using Partial Differential Equations (PDEs). 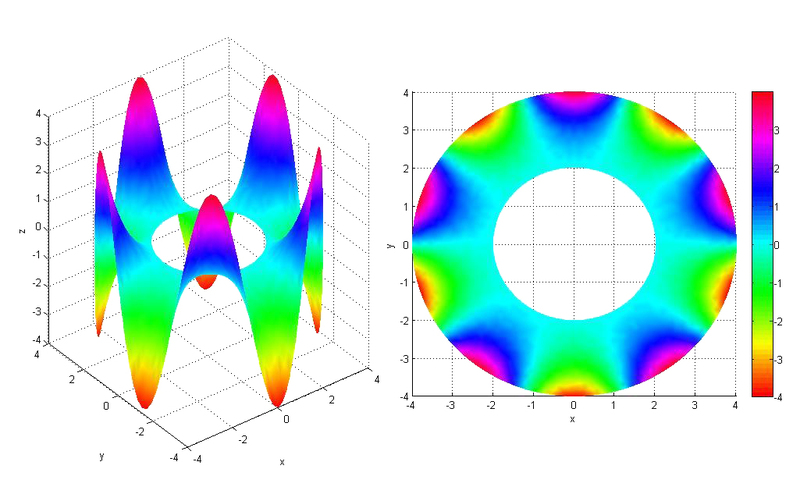 However, for a computer to solve these PDEs, numerical techniques have been developed over the last few decades and one of the prominent ones, today, is the Finite Element Analysis. Differential equations can not only describe processes of nature but also physical phenomena encountered in engineering mechanics. These partial differential equations (PDEs) are complicated equations that need to be solved in order to compute relevant quantities of a structure (like stresses (\(\epsilon\)), strains (\(\epsilon\)), etc.) in order to estimate a certain behavior of the investigated component under a given load. It is important to know that FEA only gives an approximate solution of the problem and is a numerical approach to get the real result of these partial differential equations. Simplified, FEA is a numerical method used for the prediction of how a part or assembly behaves under given conditions. It is used as the basis for modern simulation software and helps engineers to find weak spots, areas of tension, etc. in their designs. The results of a simulation based on the FEA method are usually depicted via a color scale that shows for example the pressure distribution over the object. Depending on one’s perspective, FEA can be said to have its origin in the work of Euler, as early as the 16th century. However, the earliest mathematical papers on Finite Element Analysis can be found in the works of Schellbach  and Courant . FEA was independently developed by engineers in different companies and industries to address structural mechanics problems related to aerospace and civil engineering. The development for real life applications started around the mid-1950s as papers by Turner, Clough, Martin and Topp , Argyris  and Babuska and Aziz  show. The books by Zienkiewicz  and Strang and Fix  also laid the foundations for future developments in FEA. A system with a finite number of unknowns is called a discrete system. A system with an infinite number of unknowns is called a continuous system. Where \(u^h(x)\) is the approximation, which differs from the real solution \(u(x)\) with the error term \(e(x)\) which is not known before. De facto, this error term has to vanish so that the approximate solution \(u^h(x)\) becomes valid. The question that arises is how \(u^h(x)\) can be parametrized in a discrete function space. One possible solution is to express \(u^h(x)\) as a sum of shape function \(\phi_i(x)\) with coefficients \(\alpha_i(x)\). The line illustrated at the top shows this principle for a 1D problem. \(u\) can represent the temperature along the length of a rod that is heated in an nonuniform manner. In our case, there are four elements along the x-axis, where the function defines the linear approximation of the temperature illustrated by dots along the line. One of the biggest advantages we have when using the Finite Element Analysis is that we can either vary the discretization per element or discretize the corresponding basis functions. De facto, we could use smaller elements in regions where high gradients of \(u\) are expected. For the purpose of modelling the steepness of the function we need to make approximations. Before proceeding with the Finite Element Analysis itself, it is important to understand the different types of PDE’s and their suitability for FEA. Understanding this is important to everyone, irrespective of one’s motivation to using finite element analysis. One should constantly remind oneself that FEA is a tool and any tool is only as good as its user. PDE’s can be categorized as elliptic (are quite smooth), hyperbolic (support solutions with discontinuities), and parabolic (describe time dependent diffusion problems). When solving these differential equations boundary and/or initial conditions need to be provided. Based on the type of PDE, the necessary inputs can be evaluated. Examples for PDE’s in each category include Poisson equation (Elliptic), Wave equation (Hyperbolic) and Fourier law (Parabolic). There are two main approaches to solving elliptic PDE’s – Finite Difference Analysis (FDA) and Variational (or Energy) Methods. 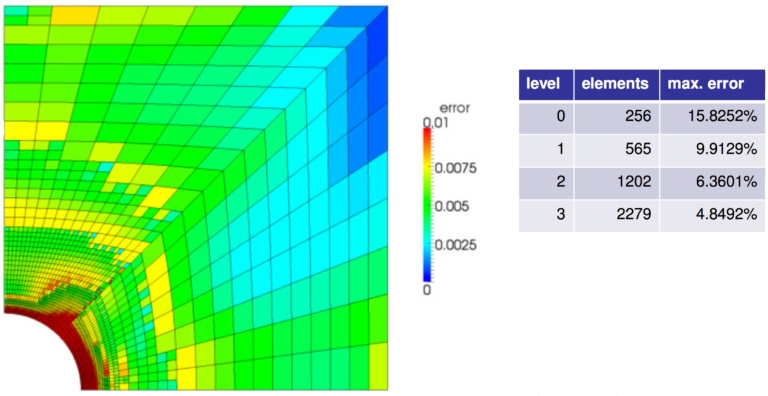 FEA falls into the second category of variational methods. Variational approaches are primarily based on the philosophy of energy minimization. Hyperbolic PDE’s are commonly associated with jumps in solutions. The wave equation for instance is a hyperbolic PDE. Owing to the existence of discontinuities (or jumps) in solutions, the original FEA technology (or Bubnov-Galerkin Method) was believed to be unsuitable for solving hyperbolic PDE’s. However, over the years, modifications have been developed to extend the applicability of FEA technology. It is important to consider the consequence of using a numerical framework that is unsuitable for the type of PDE that is chosen. Such usage leads to solutions that are known as “improperly posed”. This could mean that small changes in the domain parameters lead to large oscillations in the solutions or the solutions exist only on a certain part of the domain or time. These are not reliable. Well-posed solutions are defined with a unique one, that exists continuously for the defined data. Hence, considering reliability, it is extremely important to obtain them. The mathematical models of heat conduction and elastostatics covered in this series consist of (partial) differential equations with initial conditions as well as boundary conditions. This is also referred to as the so-called Strong Form of the problem. A few examples of “strong forms” are given in the illustration below. Second order partial differential equations demand a high degree of smoothness for the solution \(u(x)\). That means that the second derivative of the displacement has to exist and has to be continuous! This also implies requirements for parameters that can not be influenced like the geometry (sharp edges) and material parameters (different Young’s modulus in a material). To develop the finite element formulation, the partial differential equations must be restated in an integral form called the weak form. The weak form and the strong form are equivalent! In stress analysis, the weak form is called the principle of virtual work. The given equation is the so-called weak form (in this case the weak formulation for elastostatics). The name states that solutions to the weak form do not need to be as smooth as solutions of the strong form, which implies weaker continuity requirements. You have to keep in mind that the solution satisfying the weak form is also the solution of the strong counterpart of the equation. Also remember that the trial solutions \(u(x)\) must satisfy the displacement boundary conditions. This is an essential property of the trial solutions and this is why we call those boundary conditions essential boundary conditions. If you want to read about the equivalence between the weak and strong formulation, please read more in the forum topic about the equivalence between the weak and strong formulation of PDEs for FEA. Find more about the minimum potential energy in our related forum topic. One of the most overlooked issues in computational mechanics that affect accuracy, is mesh convergence. This is related to how small the elements need to be to ensure that the results of an analysis are not affected by changing the size of the mesh. 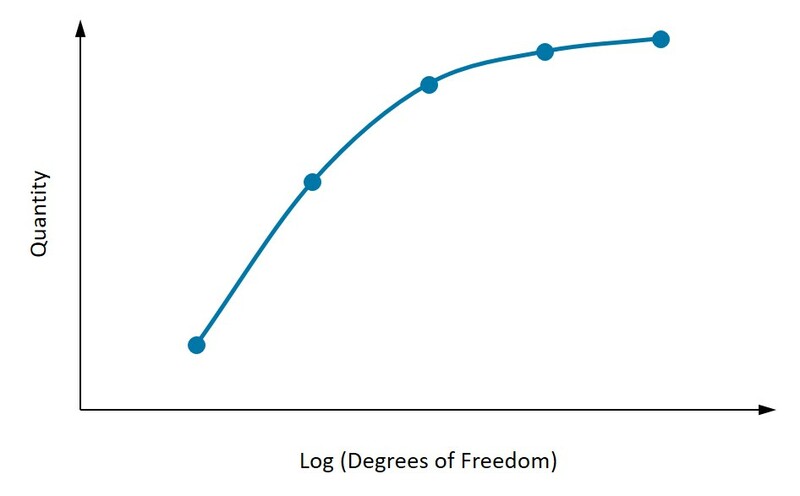 The figure above shows the convergence of quantity with increase in degrees of freedom. As depicted in the figure, it is important to first identify the quantity of interest. At least three points need to be considered and as the mesh density increases, the quantity of interest starts to converge to a particular value. If two subsequent mesh refinements do not change the result substantially, then one can assume the result to have converged. Going into the question of mesh refinement, it is not always necessary that the mesh in the entire model is refined. St. Venant’s Principle enforces that the local stresses in one region do not affect the stresses elsewhere. 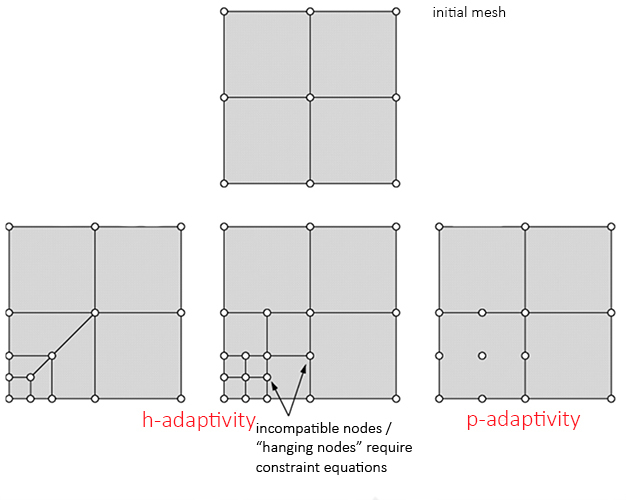 Hence, from a physical point of view, the model can be refined only in particular regions of interest and further have a transition zone from coarse to fine mesh. There are two types of refinements (h- and p-refinement) as shown in the figure above. h-refinement relates to the reduction in the element sizes, while p-refinement relates to increasing the order of the element. Refinement like this can allow an increase in the convergence of solutions without increasing the size of the overall problem being solved. So now that the importance of convergence has been discussed, how can convergence be measured? What is a quantitative measure for convergence? The first way would be to compare with analytical solutions or experimental results. where \(u\) is the analytical solution for the field. where \(\epsilon\) is the analytical solution for the strain field. where \(\sigma\) is the analytical solution for the stress field. As shown in the equations above, several errors can be defined for displacement, strains and stresses. These errors could be used for comparison and they would need to reduce with mesh refinement. However, in a FEA mesh, the quantities are calculated at various points (nodal and Gauss). So in this case, what needs to be determined is where and at how many points should the error be calculated. Learn more about how to measure convergence. With static analysis, you can analyze linear static and nonlinear quasi-static structures. In a linear case with an applied static load, only a single step is needed to determine the structural response. Geometric, contact and material nonlinearity can be taken into account. An example is a bearing pad of a bridge. 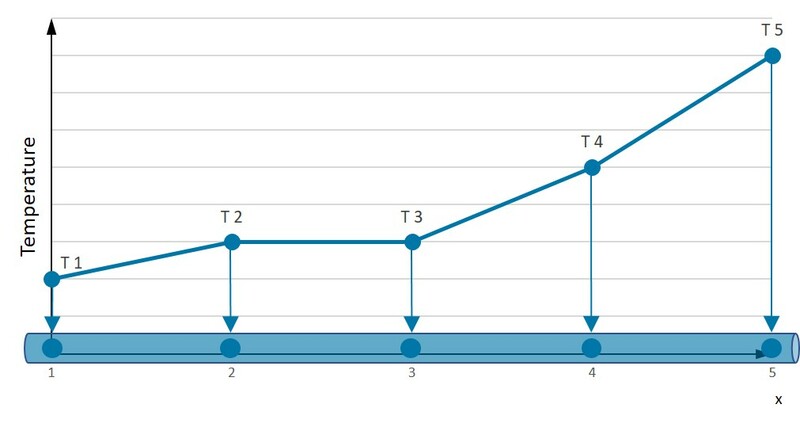 Dynamic analysis helps you analyze the dynamic response of a structure that experienced dynamic loads over a specific time frame. To model the structural problems in a realistic way, you can also analyze impacts of loads as well as displacements. An example is the impact of a human skull, with or without a helmet. Eigenfrequencies and eigenmodes of a structure due to vibration can be simulated using modal analysis. The peak response of a structure or system under a given load can be simulated with harmonic analysis. An example is the start of an engine. The Bubnov-Galerkin method requires continuity of displacements across elements. Problems like contact, fracture and damage however, involve discontinuities and jumps that cannot be directly handled by Finite Element Methods. To overcome this shortcoming, XFEM was born in 1990’s. XFEM works through expansion of the shape functions with Heaviside step functions. Extra degrees-of-freedom are assigned to the nodes around the point of discontinuity so that the jumps can be considered. GFEM was introduced around the same time as XFEM in the 90’s. It combines the features of traditional FEM and meshless methods. Shape functions are primarily defined in the global coordinates and further multiplied by partition-of-unity to create local elemental shape functions. One of the advantages of GFEM is the prevention of re-meshing around singularities. In several problems, like contact or incompressibility, constraints are imposed using Lagrange multipliers. These extra degrees of freedom arising from Lagrange multipliers are solved independently. The system of equations is solved like a coupled system of equations. hp-FEM is a combination of using automatic mesh refinement (h-refinement) and increase in order of polynomial (p-refinement). This is not the same as doing h- and p- refinements separately. When automatic hp-refinement is used, and an element is divided into smaller elements (h-refinement), each element can have different polynomial orders as well. 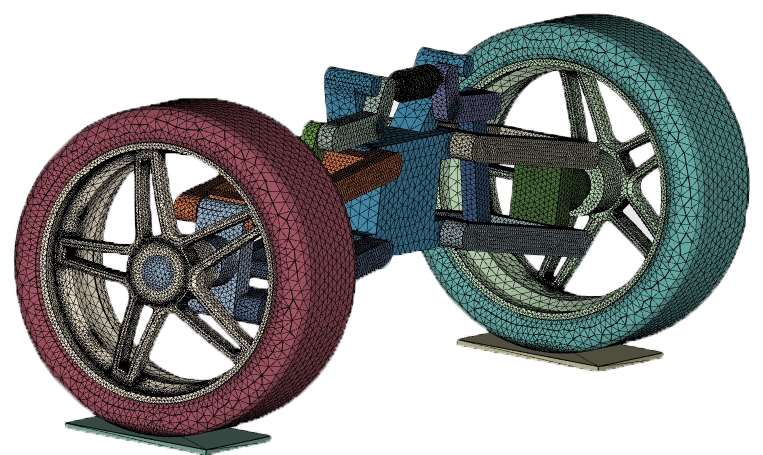 DG-FEM has shown significant promise for using the idea of Finite Elements for solving hyperbolic equations where traditional Finite Element Methods have been weak. In addition, it has also shown promise in bending and incompressible problems which are commonly observed in most material processes. Here additional constraints are added to the weak form that include a penalty parameter (to prevent interpenetration) and terms for other equilibrium of stresses between the elements. The Finite Element Analysis (FEA) component of SimScale enables you to virtually test and predict the behavior of structures and hence solve complex structural engineering problems subjected to static and dynamic loading conditions. The platform uses scalable numerical methods that can calculate mathematical expressions and would otherwise be very challenging due to complex loading, geometries or material properties.